​Enjoy the benefits of aloe vera in several healthy varieties of fresh, stabilized aloe vera gel. The primary ingredient of all varieties is raw aloe vera gel, which provides a rich supplement to healthy nutrition. Drink any one of these on a daily basis to assist digestion and absorption of nutrients, to add vitamins, minerals and amino acids to your diet, and above all, to promote a good, healthy lifestyle. Forever Living Products offers four types of Aloe Vera Gel (drinking juice), see each of them listed below with detailed description and ingredients. Made from the best of the best - Barbadensis Miller (Aloe Vera) plant. FLP Aloevera Gel - The most popular FLP drink and product overall offered by FLP. Actual aloe juice with pulp! This is the FLP patented (cold pressed and stabilized) and certified by the International Aloe Science Council (IASC) - Aloe Vera Juice. Rich with vitamins, nutrition, amino acids and other useful ingredients that our body appreciates greatly. To be used for maintaining a healthy digestive system. Contains Stabilized Aloe Vera Gel, Sorbitol, Ascorbic Acid (Antioxidant), Citric Acid, Potassium Sorbate (To Help Protect Flavor), Sodium Benzoate (To Help Protect Flavor), Xanthan Gum, Tocopherol (Antioxidant). This package contains one liter of aloe vera gel. This is the #1 product of all aloe vera products. It is like a holy drink! Did you know that miraculous aloevera leaf contains 200 compounds? There are 20 minerals, 18 amino acids, and 12 vitamins. This aloe vera gel package contains one liter of liquid and it is valid for four (4) years. After opening the package, keep in refrigeration. Suggested intake - as needed. The aloe vera drink is very gelicious, and after taking it few times I really got used to the taste. ​This is an extension of original Aloe Vera Gel - Another Aloe Juice. Aloe Berry Nectar contains everything just like Aloe Vera Gel, and in addition to that added benefits of cranberry and apple fruits. Because of Apple and cranberry found in this drink it is more tasty to drink. However, some people like the drink Aloevera more. It comes to the personal preference. You can enjoy Aloe Berry Nectar by itself or you can have it with your meal instead of juice. Just like Aloe Vera Gel, Aloe Berry Nectar is pure natural product. Contains almost 34 ounces (1 L). ​With addition of peaches, this drink tastes even better. It has all benefits like Aloevera Gel, with Peach taste. Like other packaging, this drink comes in a small one liter container, that is easy to handle, even when you travel it doesn't take a lot of space. This juice is really mild, and most kids chose this options. For most problems with joints this is a great drink and Glucosamine Sulfate are natural compounds that help keep the structure and health of cartilage, keeping this natural “shock absorber” well hydrated. Forever Freedom has joined aloe vera with substances that are useful for the maintenance of proper joint function and mobility in a tasty and orange flavored juice mixture. Many athletes are preferring Forever Freedom over Original Aloe Vera Gel Drink. Well known not only in Canada, but around the world. ​Forever Pomesteen Power’s great tasting blend is a unique mix of fruit juices and extracts, including Pomegranate, Pear, Mangosteen, Raspberry, Blackberry, Blueberry and Grape Seed. Experience the incredible power of antioxidants with Forever Pomesteen Power! Pomesteen is a juice that FLP has finally added to their exclusive range of products. The Pomegranate has more antioxidants than blueberries, green tea or wine. The Mangosteenfruit has the highest content of xanthones found in any fruit. Some studies have shown that xanthones are even better than vitamins C and E for boosting the body's immune system! Aloe Vera Gel provides natural support for the immune system because of its high content of polysaccharides. With so many health benefits, it’s no wonder L-Arginine is generating so much excitement. Tea made of aloe vera blossom and mixed with some other ingredients like: Cinnamon, Ginger, Allspice, Orange Peel, Chamomile and several others. Aloe Blossom Herbal Tea is a natural blend of leaves, herbs and spices, especially prepared to provide an outstanding flavor and a rich aroma. It contains 25 individually foiled tea bags. 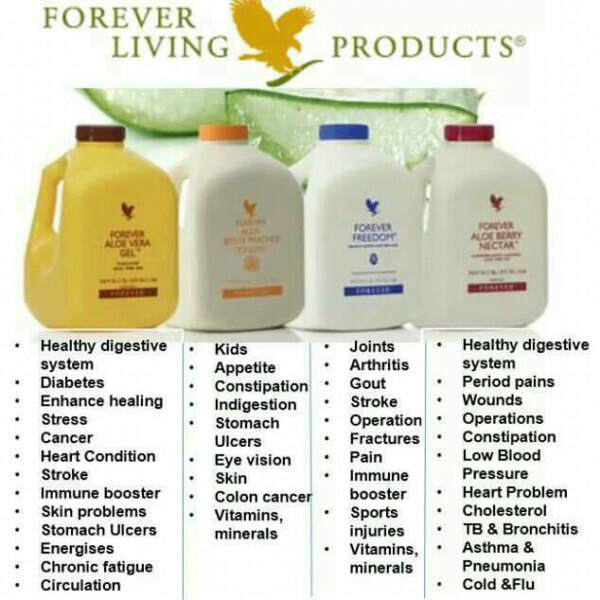 ALOE JUICE PRODUCTS: Forever Freedom Drink, Aloe Bits and Peaches, Aloe Berry Nectar, Pomesteen Power, Aloe 2Go, Aloe Vera Gel, Mangosteen, Mango, Immune System, Digestive System, Antioxidants, Blossom Tea.